Integrative bargaining (also called “interest-based bargaining,” “win-win bargaining”) is a negotiation strategy in which parties collaborate to find a “win-win” solution to their dispute. This strategy focuses on developing mutually beneficial agreements based on the interests of the disputants. Interests include the needs, desires, concerns, and fears important to each side. They are the underlying reasons why people become involved in a conflict. “Integrative refers to the potential for the parties’ interests to be [combined] in ways that create joint value or enlarge the pie.” Potential for integration only exists when there are multiple issues involved in the negotiation. This is because the parties must be able to make trade-offs across issues in order for both sides to be satisfied with the outcome. There are often many interests behind any one position. If parties focus on identifying those interests, they will increase their ability to develop win-win solutions. The classic example of interest-based bargaining and creating joint value is that of a dispute between two little girls over an orange. Both girls take the position that they want the whole orange. Their mother serves as the moderator of the dispute and based on their positions, cuts the orange in half and gives each girl one half. This outcome represents a compromise. However, if the mother had asked each of the girls why she wanted the orange — what her interests were — there could have been a different, win-win outcome. This is because one girl wanted to eat the meat of the orange, but the other just wanted the peel to use in baking some cookies. If their mother had known their interests, they could have both gotten all of what they wanted, rather than just half. Identifying Interests: The first step in integrative bargaining is identifying each side’s interests. This will take some work by the negotiating parties, as interests are often less tangible than positions and are often not publicly revealed. A key approach to determining interests is asking “Why?” Why do you want that? Why do you need that? What are your concerns? Fears? Hopes? If you cannot ask these questions directly, get an intermediary to ask them. You must also analyze the potential consequences of an agreement you are advocating, as the other side would see them. This is essentially the process of weighing pros and cons, but you attempt to do it from the perspective of the other side. Carrying out an empathetic analysis will help you understand your adversary’s interests. Then you will be better equipped to negotiate an agreement that will be acceptable to both of you. There are a few other points to remember about identifying interests. First, you must realize that each side will probably have multiple interests it is trying to satisfy. Not only will a single person have multiple interests, but if you are negotiating with a group, you must remember that each individual in the group may have differing interests. Also important is the fact that the most powerful interests are basic human needs - security, economic well being, a sense of belonging, recognition, and control over one’s life. If you can take care of the basic needs of both sides, then agreement will be easier. You should make a list of each side’s interests as they become apparent. This way you will be able to remember them and also to evaluate their relative importance. This chart was derived from a more complex chart in Fisher, Roger, William Ury, and Bruce Patton. (1991) Getting to Yes: Negotiating Agreement Without Giving In, Second Edition. New York: Penguin Books. p. 13. After interests are identified, the parties need to work together cooperatively to try to figure out the best ways to meet those interests. Often by “brainstorming” — listing all the options anyone can think of without criticizing or dismissing anything initially, parties can come up with creative new ideas for meeting interests and needs that had not occurred to anyone before. The goal is a win-win outcome, giving each side as much of their interests as possible, and enough, at a minimum that they see the outcome as a win, rather than a loss. Although distributive bargaining is frequently seen as the opposite of integrative bargaining, the two are not mutually exclusive. Distributive bargaining plays a role in integrative bargaining, because ultimately “the pie” has to be split up. Watkins, Michael and Susan Rosegrant, Breakthrough International Negotiation: How Great Negotiators Transformed the World’s Toughest Post-Cold War Conflicts (San Francisco: Jossey-Bass, 2001), 31. The principal ideas regarding identifying interests outlined here were drawn from Getting to Yes. 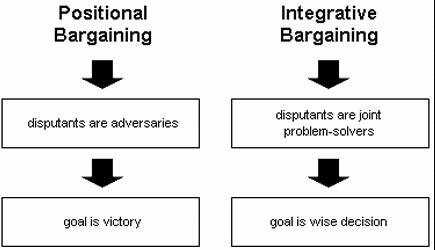 The idea that integrative or interest-based bargaining will always include distributive bargaining too, was originally put forth by David Lax and James Sebenius in The Manager as Negotiator: Bargaining for Cooperation and Competitive Gain, 1986.